Exchange sounds and songs and play with up to eight units simultaneously through a wireless communications link. 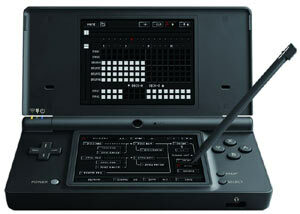 Improved professional-grade music tool software for Nintendo DSi/DS at a greater cost performance value than the original KORG DS-10. 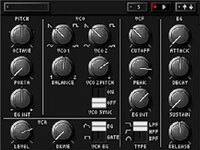 Optimized for DSi with 12-voice polyphony and to double the power of the original KORG DS-10: 4 analog synthesizer tracks and 8 dedicated drum tracks, increase the total number of tracks from 6 to 12 (DSi only). Song mode revamped for expanded song composition and real-time performance. Per track Mute/Solo built into the Song Mode, and Edit/Play enabled for all modes to further improve real-time performance (available for DSi/DS). Delay, chorus, and flanger sound effects available from the mixing board, and three different note-entry modes: Touch Screen control, keyboard screen, and matrix screen. The KORG DS-10 Plus is an enhanced version of the revolutionary KORG DS-10 synthesizer software that was released to critical and retail acclaim for the Nintendo DS in late 2008. The original KORG DS-10 music-creation software, which combined the superior interface of the Nintendo DS with the functionality of the famous MS-10 synthesizer, has been optimized to essentially double the power of the original when used with the Nintendo DSi. The sound sources in the KORG DS-10 Plus come from KORG - one of the world's top musical instrument producers - and no effort was spared in creating these ultra-high-quality sounds. The Nintendo DSi/DS Touch Screen controls are used to the fullest to provide unsurpassed feel and operability. This innovative musical tool is perfect for aspiring musicians and professionals alike. In addition to the four analog synth simulators and drum module, a 12-track/16-step sequencer enables precise control and provides a wide range of musical possibilities (only two analog synthesizers and six tracks available when used with regular Nintendo DS). Up to eight units can be connected and played together through a wireless link for a jam session or to exchange songs. This and other features make the Nintendo DSi/DS and KORG DS-10 Plus almost limitless in their application – improved portable music creation performance at an unparalleled value. KORG DS-10 Plus is an enhanced version of the revolutionary KORG DS-10 synthesizer software that was released to critical and retail acclaim for Nintendo DS in late 2008. In this new release the original KORG DS-10 music-creation software, which combined the superior interface of the Nintendo DS with the functionality of the famous MS-10 synthesizer, has been optimized to essentially double the power of the original when used with the Nintendo DSi. Innovative Handheld Musical Tool The sound sources in KORG DS-10 Plus come from KORG - one of the world's top musical instrument producers - and no effort was spared in creating these ultra-high-quality sounds. In addition, the Nintendo DSi/DS Touch Screen controls are used to the fullest to provide unsurpassed feel and operability, making this an innovative musical tool that is perfect for both aspiring musicians and professionals alike. Work a professional style synth on your DS or DSi. View larger. 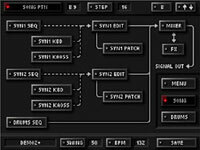 In addition to the four analog synth simulators and drum module, a 12-track/16-step sequencer enables precise control and provides a wide range of musical possibilities (only two analog synthesizers and six tracks available when used with Nintendo DS). Up to eight units can be connected and played together through a wireless link for a jam session or to exchange songs. This and other features make Nintendo DSi/DS and KORG DS-10 Plus almost limitless in their application and provide improved portable music creation performance at an unparalleled value. 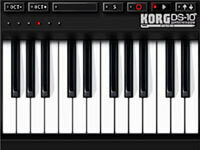 Key Game Features Improved professional-grade music tool software for Nintendo DSi/DS at a greater cost performance value than the original KORG DS-10. Optimized for Nintendo DSi for 12-voice polyphony and to double the power of the original KORG DS-10: 4 analog synthesizer tracks and 8 dedicated drum tracks, increasing the total number of individual tracks from 6 to 12 (feature not available when used on regular DS). Song mode revamped for expanded song composition capabilities and real-time performance. Per track Mute/Solo built into the Song mode, and Edit/Play enabled for all modes within the Song mode to further improve real-time performance (compatible with both Nintendo DSi/DS). 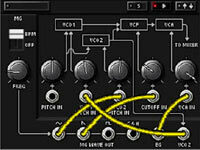 Delay, chorus, and flanger sound effects available from the mixing board. Three different note-entry modes: Touch Screen control, keyboard screen, and matrix screen. Exchange sounds and songs and play with up to eight units simultaneously through a wireless communications link. Realistic synth controls. View larger. Patching between tracks. View larger. Dual screen functionality. View larger. s="h3color tiny">This review is from: KORG DS-10 Plus (Video Gam.. Almost as soon as I received my KORG DS-10 in the mail, I picked up a second copy and another DS Lite. Then I heard about the KORG DS-10 Plus and realized that I had been played for a chump since the new version would basically let me do the same thing as two copies, minus the awkwardness of holding two DS systems and wearing two sets of headphones when I was using them outside of my home studio. Naturally, I pre-ordered it as soon as I was able to, a..
Kurt Best (USA / Washing..